At my house, whenever I bake cookies they never last more than a day. My kids and hubby LOVE cookies...ok me too I must admit. Not good for our bodies, but there is no way to keep the cookies in the cookie jar at my house. Here are some of my tips to make any cookie and holiday cookies healthier! 1. Use whole wheat flour instead of white. not only is it healthier but it has more fiber. 2.Try decorating without food coloring in frosting. Food coloring is an artificial ingredient. 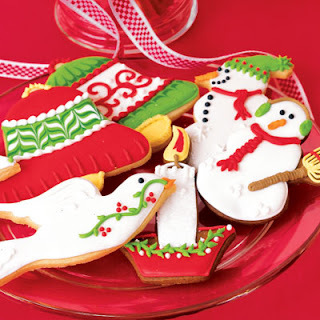 Instead try decorating with white frosting or royal icing,melted chocolate, jams and use nuts for decorating. 3.Try adding a little bit of flax seed oil or oats. Even if you blend up with oats they are still in there! 4.. Don't make HUGE cookies. Tiny ones let you enjoy the cookie without the huge calorie amount. Smaller ones are good for kids too. Just the right amount. 5. Also watch how much butter you use! It is loaded with saturated fats! Cut back on it and maybe substitute half of it with Canola oil.